So I have finally been able to sit down and make a card. I have been soooo busy. We were on vacation in Pennsylvania for 2 weeks. While we were there my husband tripped and fell into the fire so when we got back he had dr appointments every day on top of all of our regular stuff so its been pretty crazy. I have new stamps that I havent even been able to use yet. I have so many ideas its just finding the time, and I really should get some save the date cards done for my cousins wedding seeing as how she wants them in September. So I am making myself do those before I really get any other stamping done. So.. here is the card I made. I really LOVE the colors together. I used Baja Breeze and chocolate Chip. I think if I were to do it again I would add a background or designer paper to the blue scalloped part, otherwise i really like it. 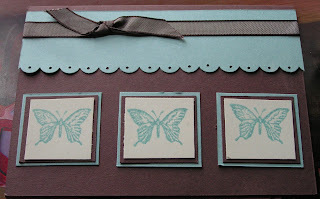 I used brown taffeta ribbon and the Dreams DuJour stamp. To make the scallops I used the new fabulous scallop edge punch. I dont know how we survived without it. It is soooo much easier than making scallops with the slit or circle punch! If you dont have one, it is a Must Have. Thanks for stopping by. off to get ready for a Surprise Birthday Party. Have a Great Weekend! Your Invited to a Big Shot Preview Party! Stampin UP! has added another fantastic product to the family and I'm excited to show it to you. We now carry the Sizzix Big Shot die cutting machine. What would you use a die cutting machine for? You might ask. Really the possibilities are endless! 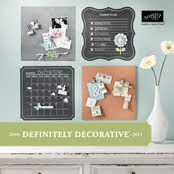 Scrapbook pages, cards, home decor and more. Come find out how versatile this tool really is. This is a great way to try before you buy and the best part is that the party is FREE! Just stop by any time between 6:00 - 9:00 pm and we'll show you how easy it is to use and you'll even get to make a project with it. If you find out that it's something you just "have to have" then join my Big Shot club. What is the big shot club? Think of it as a payment plan for your big shot. The club will run for 4 months September - December. The price of the Big Shot will be split into 4 equal payments of $56.34 (includes tax and s&h). After the 4th payment I will be hosting a Big Shot Party in December where all club members will pick up their machine and we'll spend the evening making fabulous projects using the Big Shot of course! What do you get for your club payments? 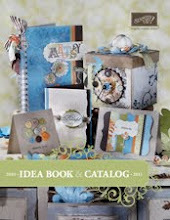 $15.00 in free merchandise from the catalog. 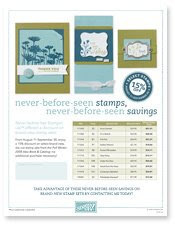 Thats right... 15% off select stamps until September 30th and let me tell you they have chosen some nice stamps to give a discount on! I will get some projects done with some of them and get them posted as soon as I have some free time. If you want to get some first hand experience with them then join us on September 19th. We will be using pocket silhouettes and heard from the heart to make some coasters (which I will be posting hopefully by monday). If that doesnt work for you, check out my calendar at http://www.laurafiske.stampinup.net/ to see if there are any other classes you might be able to attend. Thanks for stopping! Have a Fantastic Day! So... I havent updated my blog since what.. i think it said the 11th. Sorry about that. We went on a mini vacation to manchester (to visit my sister in law) and to Maine to check out the beach...which was insanely cold! anyways, when we got back I had surgery on my wrist so I didnt really have any typing abilities and then my computer was getting fixed. So I finally got my computer back this morning and it is all set up, however I dont have time to update you on all of the VERY EXCITING things going on with Stampin Up. However I will let you all know that I am in the process of getting my demonstrator site up and going which you will be able to find at http://www.laurafiske.stampinup.net/ after Im finished gettin it set up, hopefully by tomorrow and one other important thing that will affect all of my Mass customers, its tax free day August 16 and 17th. So start putting your orders together now!! Remember that August 10th is the last day to order out of the current catalog so make sure you get me your orders this week! Oh and guess what.. i know Im terrible at keeping stuff in..... Stampin Up announced that we are now selling the Sizzix Big Shot die cutting machine!!! I am soooo excited!! I will post more details later.